Cauliflower florets are delicately grilled with oil and spices.Very tasty recipe(tastes very much South-Indian) and can be done in 10 mins. This can be served as a starter or with rice and sambar.Try at home and post your comments. Boil 5 cups of water and put 2 tsp chilli powder,1 tsp salt and 1/2 tsp turmeric powder.Turn off the flame. Add cauliflower florets to it and close the lid then drain the water after 3 mins. keep it aside. 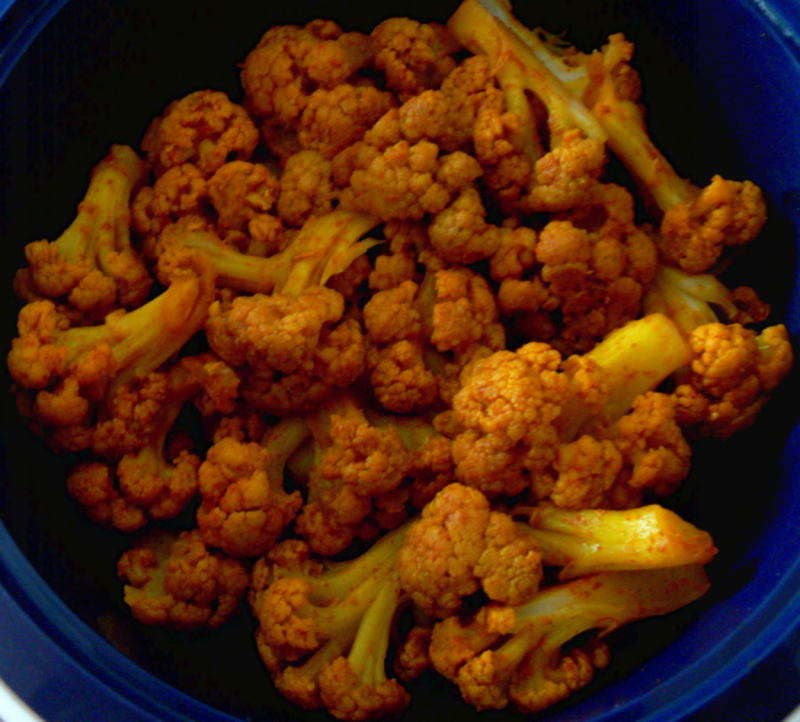 Mix all the remaining ingredients(the masala well) and apply the paste evenly on cauliflower florets. Remove the microwave-cooking tray and replace this with the tray used for grilling. Grease the tray with 1 tsp refined oil using a brush(to a smaller area only). Spread the cauliflower florets on the tray at equal distance. Grill the cauliflower pieces for 6 mins and then turn them over and again grill for 4 more mins. Wait for 5 mins,then remove the tray from the microwave-oven and garnish them with fried curry leaves and Coriander leaves. Serve them hot with rice and sambar,onion slices and lemon wedges.